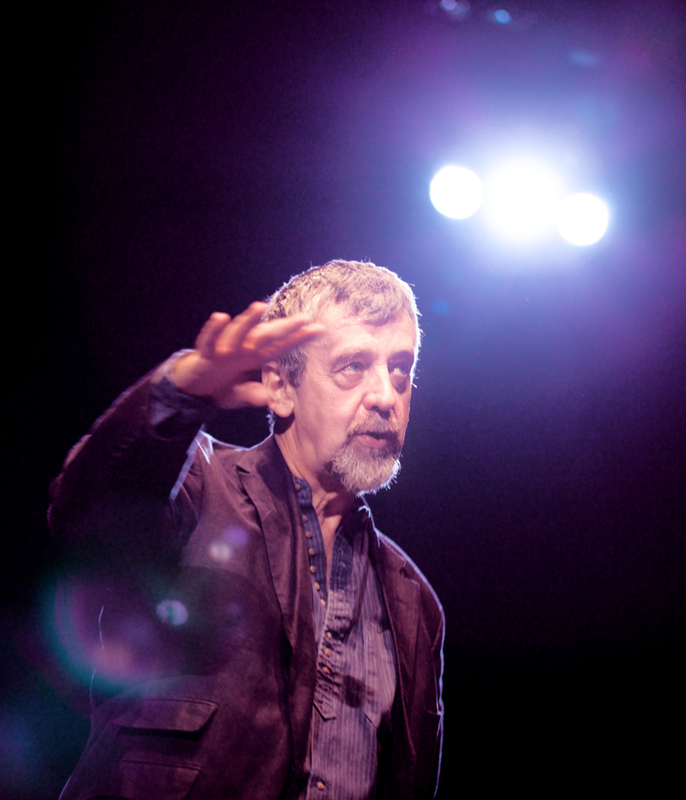 Novelist and playwright, Michael Harding, has become a popular on-stage performer throughout Ireland, a fact reflected in the eager, packed audience at An Grianan theatre in Donegal this weekend Friday during a stopover on his latest national tour. “I think I’ll start organising workshops training people how to doze properly,” he said tongue-in-cheek. Nostalgia: He recounts homespun, heart-warming tales about life, love and growing old; about mothers and families and childhood, suggestions of innocence reminiscent of our own youth, of those fading bygone years we’ll never experience again but in which we bathe joyously for the remembering and the re-telling. Sympathy: One of Harding’s strengths is that he is unafraid to bear his soul, to show his vulnerable side. With a hint of melancholy, he touches – often poignantly – upon self-doubts, mistakes, indecisions, depression and the other suitcases of distress that life tends to carry with it. And we feel for him and support him and want him so dearly to succeed because – aside from altruism – if he emerges okay at the other end, then there’s hope for the rest of us. 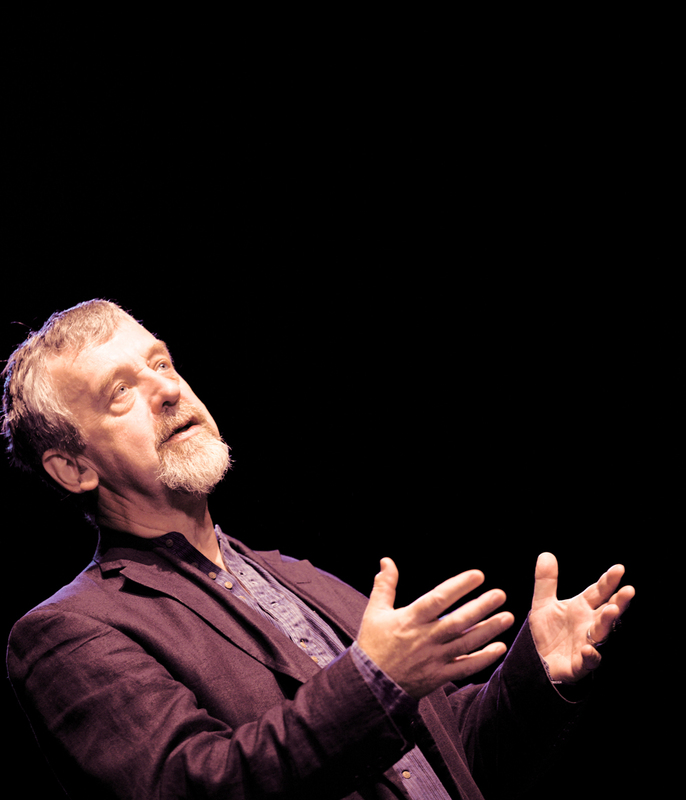 Overall the evening with Michael Harding was a most enjoyable occasion, ripe with amusing, philosophical ramblings that left the audience departing the theatre wrapped in added layers of warmth to fend off the cold, biting weather awaiting them outside. 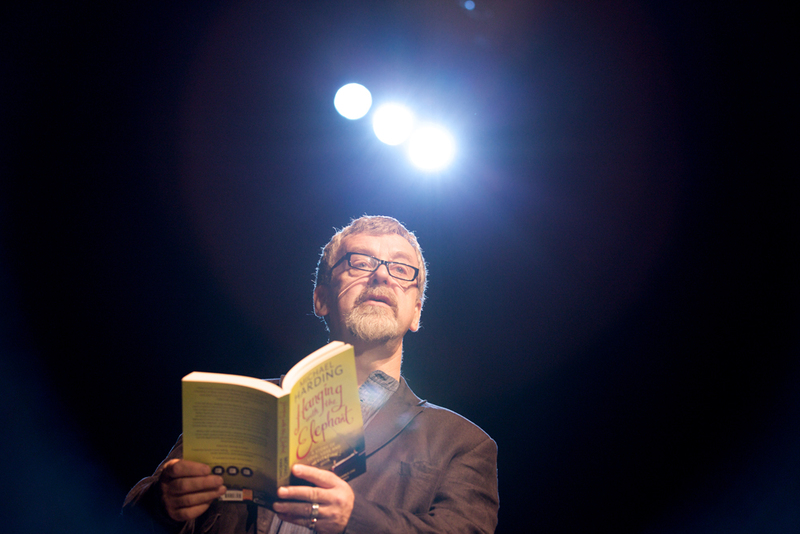 With only a mysterious suitcase on the floor stage centre, a padded armchair and his lectern as props, Harding took his listeners on a delightful stroll down ‘Nostalgia Avenue,’ his deft turns of phrase encapsulating many-layered meanings in a flurry of simple-seeming words. His ability to mix ‘n match moods, swinging rapidly from melancholy to bittersweet to outright hilarity was impressive, all part and parcel of personal anecdotes gleaned from the trials and tribulations of his own life. One illustrative example is when he described how his mother would make him wait in the street in front of a draper’s shop while she went in to buy “women’s things” leaving him “to develop childhood neuroses outside,” then in response to the shop-owner asking if he was her son, she’d say yes but that she would have preferred a daughter. And how, not having sisters, it took a visit by three Letterkenny girls to his home for him to see “women’s things” first-hand. “Their bras hanging in the bathroom like a line of dead rabbits,” as he amusingly put it. The writer’s description of rummaging through his mother’s belongs soon after her death was emotive by its sheer simplicity. “I found my dead mother in little boxes and drawers,” he said before recounting exactly what he found. Harding, not surprisingly, has a love for his native Cavan, though he admits, with himself foremost in mind, that, “you’re not going up in the world merely by going from Cavan to Leitrim,” adding that he is more a refugee seeking asylum” in his adopted county. The only trouble with Cavan, he concludes, is the drumlins, “You’re always only a few feet from the horizon.” Metaphor or not, it is still a wonderful turn of phrase. An oft-quoted saying is that ‘one can never go back home,’ but Harding achieves the next best thing, resurrecting vivid memories of places and people from his past that help bring an audience on an enjoyable and entertaining journey of nostalgia. Posted in Arts & EntertainmentTagged A Prairie Home Companion, An Grianan, author, books, Buddhist, Catholic, church, columnist, Donegal, entertainment, Gaelic, Garrison Keillor, Hanging with the Elephant, Ireland, Irish, Irish Times, Michael Harding, NPR radio, reading, show, Staring at Lakes, theater, theatre, writerBookmark the permalink. a just and brillant description of a mans work, it made me feel as if i was sitting in the audiance taking it all in.